The Audeo V is available at Focus Hearing in 3 levels of technology (Audeo V90, Audeo V70 and Audeo V50). 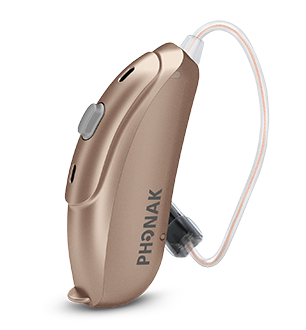 See below for a description of the Phonak Audeo range. Audeo V is available with a large variety of colours meaning it is very discreet and virtually invisible. AutoSense OS: the next generation operating system offers a seamless automatic adaption from one listening environment to another. Fully compatible to the Phonak Wireless Communication Portfolio. Indicative pricing is included in the table below, but call or email us for a quote specific to your needs. Hover over each Audeo V feature for a description of how the listed feature can benefit you.